Every day writing thrills me. But one of the biggest thrills is being nominated for the 2013 Agatha Award for Best First Novel. The Agatha Awards celebrate the traditional mystery, in the vein of Agatha Christie, and are given at the annual Malice Domestic convention. “Malice,” as its known to mystery fans, will be held this year on May 2-4 in Bethesda, Maryland. On Saturday during the convention, the five nominees share the stage with multiple award-winning mystery writer and all-around goddess Margaret Maron for talk about our books and more. So naturally, being both compulsive and curious, I’ve been reading the other nominated books. Ohmygosh, what fun! If you like your mysteries lively, funny, jammed with yummy food and quirky characters, set in charming locales with more than a pinch of intrigue, dig in! Pasta, a Festa, a grandmother who wears kimonos, and a character named Landon. Sounds like I’m talking about my own Death al Dente, doesn’t it? Nope. It’s You Cannoli Die Once by Shelley Costa (Simon & Schuster). The Festa is the Festa della Repubblica, Landon is Chef Eve’s 20-something cousin and sous-chef, and the grandmother is their shared nonna, jailed for the murder of her boyfriend on the kitchen floor of Miracolo, the Philadelphia-area restaurant she owns and Eve runs. Convinced her grandmother is innocent, Eve organizes the staff to investigate, only to find herself in hot water. Don’t read this on an empty stomach! Elliot “Ellie” Lisbon loves her life as a Foundation director and private investigator in training in a South Carolina island community, until she finds a board member dead and the board chair—“the most unpleasant person on Planet Earth”—is charged with his murder, in Board Stiff by Kendel Lynn (Henery Press). What’s worse? The local PD’s new lieutenant is the college love who dropped her like a firebomb. This is nothing like the “indiscretions” she’s been investigating! A fun romp through blackmail, murder, schemes and scams. In Kneading to Die by Liz Mugavero (Kensington), Kristan “Stan” Connor has left a prestigious job in PR after unpleasantness bordering on the criminal, and impulsively purchased a Victorian fixer in a small Connecticut town. When Stan arrives at the town vet’s office with her cat, she’s shocked to find the woman dead—and stunned to find herself a murder suspect! The special treats and meals Stan creates for her cat lead her to several unlikely friendships—and a future business, making high-quality pet food and treats—but heighten others’ suspicions. Never fear! This animal whisperer uses her ability to relate to dogs to escape a killer and make a new home for herself. Nichelle Clarke is an ambitious young crime reporter in Richmond, Virginia, wrapping up a long week, when a police boat crashes on the river, in Front Page Fatality by LynDee Walker (Henery Press). Her week gets longer when a trusted source in the police department reports missing evidence, and a deputy prosecutor goes missing, then winds up dead. Are the two incidents related? Why do police deflect her questions about the incidents—and about the strangely similar killings of two drug dealers? Why don’t they understand: Never mess with a woman who can run in high heels! 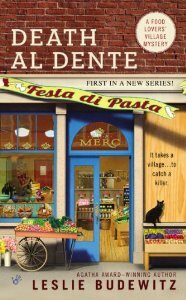 And of course, Death al Dente by Leslie Budewitz (Berkley Prime Crime). The town of Jewel Bay, Montana—known as the Food Lovers’ Village—is obsessed with homegrown and homemade Montana fare. So when Erin Murphy takes over her family’s century-old general store, she turns it into a specialty market filled with local delicacies. But Erin’s freshly booming business might go rotten when a former employee turns up dead! The Agatha Awards honor the best in six categories: Contemporary Novel, Historical, First, Short Story, Children’s/YA, and Nonfiction. The Malice site lists all the 2013 nominees and past nominees and winners. This entry was tagged Agatha Awards. Bookmark the permalink. Nice roundup. Looking forward to seeing you soon! Thanks, Barb! Looking forward to a Malicious weekend! What a great idea! I think I may borrow it for Maine Crime Writers tomorrow! And Congratulations to you, Barb, on your Agatha nomination for Best First Contemporary Novel!